^ Diplopoda DeBlainville in Gervais, 1844 (Class). SysTax. Universität Ulm, Ruhr-Universität Bochum. [2007-08-15]. ^ 2.0 2.1 2.2 Shear, W. Class Diplopoda de Blainville in Gervais, 1844. In: Zhang, Z.-Q. (Ed.) Animal biodiversity: An outline of higher-level classification and survey of taxonomic richness (PDF). Zootaxa. 2011, 3148: 159–164. ^ 嚴尚文. 馬陸 ~ 千足蟲. 2011-07-01 [2015-12-08] （中文（繁體）‎）. ^ Brewer, Michfxzdael S.; Sierwald, Petra; Bond, Jason E. Millipede Taxonomy after 250 Years: Classification and Taxonomic Practices in a Mega-Diverse yet Understudied Arthropod Group. PLoS ONE. 2012, 7 (5): e37240. PMC 3352885. PMID 22615951. doi:10.1371/journal.pone.0037240. ^ 9.0 9.1 9.2 9.3 Sierwald, Petra; Bond, Jason E. Current Status of the Myriapod Class Diplopoda (Millipedes): Taxonomic Diversity and Phylogeny. Annual Review of Entomology. 2007, 52 (1): 401–420. PMID 17163800. doi:10.1146/annurev.ento.52.111805.090210. ^ 10.0 10.1 10.2 Shear, William A.; Edgecombe, Gregory D. The geological record and phylogeny of the Myriapoda. Arthropod Structure & Development. 2010, 39 (2–3): 174–190. PMID 19944188. doi:10.1016/j.asd.2009.11.002. ^ Bueno-Villegas, Julián; Sierwald, Petra; Bond, Jason E. Diplopoda. (编) Bousquets, J. L.; Morrone, J. J. Biodiversidad, taxonomia y biogeografia de artropodos de Mexico (PDF). : 569–599. （原始内容 (PDF)存档于2016-03-04）. 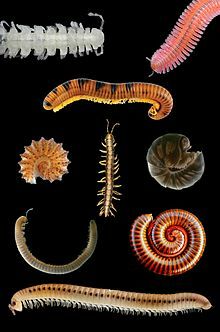 ^ Shelley, Rowland M. Millipedes. [October 12, 2013]. ^ 姜鳳梧,鄧明魯,高士賢,張義正,陳恩渝 (编). 中國藥用動物志 第二冊. 天津科學技術出版社. 1983-10 [2015-12-05] （中文）. ^ Hoffman, R. L. New genera and species of Upper Paleozoic Diplopoda. Journal of Paleontology. 1963, 37 (1): 167–174. JSTOR 1301419.